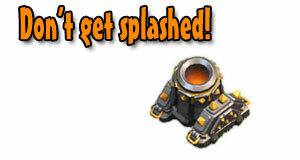 Look out for splash damage defenses like the mortar and wizard tower. Be sure that you don’t deploy large groups of low level troops near them. The splash damage defenses can and will take out whole groups in a matter of seconds. It is better to use larger troops like giants as a meat shield to take the damage and spread the low level troops behind it to do the damage.